It’s halloween again, So carve your pumpkins and don your witchs hat, and be something you want to be, could be, you are, or just be something scary, like student loans, taxes, or the job center. I thought a few years ago, Halloween was something you grew out of, about the time i lost enthusiasm for everything, was the same time knocking on peoples doors and asking for chocolate and sweets just became damn right weird. But when i was younger I used dress up, and compare my sweet huel with my best friend and love Halloween. I’m returning to that now, rekindling my childish enthusiasm even though I’m going to do nothing. 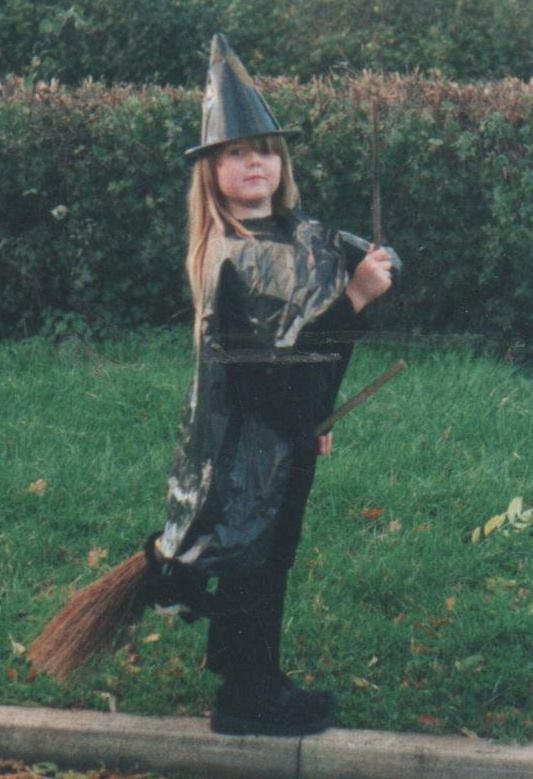 My favorite halloween costume, which i will show you a picture of, was a bin bag, a homemade broom, and a plastic witches hat, and I look ecstatic in the picture, seriously, I’m loving it. I think when my mum looks at that picture, she is reminded of the things she could not give me, the way she often feels she was just botching together my childhood, as she struggled with arguments and money, and and she is reminded of that often, not just flipping through pictures of homemade costumes, which were awesome, but in the way i deal thing every day, the things i avoid, the fears i have. I spent a long time blaming myself for the situation we were in when i was younger, i punished myself for it even though i was just a kid, i thought if i didn’t exist my mum would have been happier, she would have had a different life, even now that thought sneaks in. as I know i’m burden, a burden she loves and wouldn’t swap for the world, but why couldn’t i have been easier? not so riddled in problems. not so worrying. My mum is a good person, the best, she deserved better than me. But I think we both have this tendency to blame ourselve. I think she often wishes she could of given me a better start in this world. and perhaps thats true, perhaps a domestic war zone was not the best place to raise a child, But she did her best, she made a bin bag the best costume ever, she made a twig into a wand, and she made me smile, and not feel like I was lacking anything. And that is what is important, don’t worry about the things you give a child, how expensive their costume is, because a child will think a bin back is magical cloak if you make it exciting enough, and I know this is unoriginal but you don’t need a lot to be a good parent, you just need enough bravery to do your best, even if its just bin bag, and bit tinsel. This entry was posted in Uncategorized and tagged advice, children, dad, fatherhood, halloween, kids, motherhood, mum, parenthood. Bookmark the permalink.